At Hakko, we would like to introduce what it means to make “traditional Japanese fermented foods” and combine Western and Japanese traditions to make a whole new authentic flavor. The Hakko online store handles traditional, suitable materials and tools to make fermented Japanese foods. Since ancient times, fermented foods have been essential to the Japanese diet. In modern times, miso, soy sauce, natto, and sake are still traditional foods in Japan. Many years ago, it would have been impossible to find authentic, fermented Japanese food in the grocery aisles of American supermarkets. Now, in the age where Japanese foods are trending, you can easily find Japanese products such as miso, soy sauce, and sake at your local grocery store. There are many different selections of products you can buy, but the ones that are the safest and healthiest to eat are the ones you make at home. After graduating from Osaka, Japan, she worked at Taipei, Taiwan and moved to the United States. 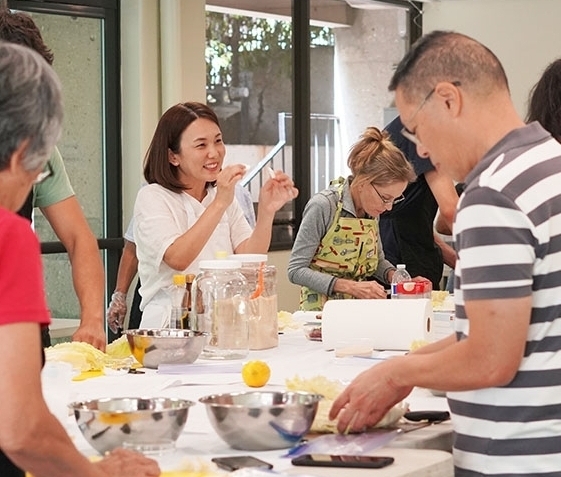 A longtime resident with her husband and three children in Los Angeles, she teaches traditional Japanese preservation foods such as miso and pickles to her community. Former member of MFP LA and now conducting her own independent fermentation projects.